This image indicates the main Adjustable Pallet Racking accessories and components from most pallet racking manufacturers including Link 51. Maintains a fixed safety clearance between double sided runs of pallet racking. Extends frames vertically, fully maintains strength at joint. Allows beams to be located across joint. To fix frames to walls for additional stability, maintains safety clearance between pallet racking and wall. Essential for stability, secures pallet racking to floor. Four duties available, to suit the four frame types. Used in pairs across beams, to support box or cage pallets with corner posts, skids or feet. Locates on front beam, cradles one end of a drum or barrel. Prevents lateral rolling of drums or cylinders. Spans beams to provide location and support for coiled materials or other cylindrical items. Used in pairs to provide fork entry spaces and support for non-palletised loads. Drop-on panels span pair of beams to provide wide-bay galvanised steel shelving. Provides wide-bay galvanised corrugated steel shelving profile, enhances hand loading capability. Fits stepped beams, to provide additional support and greater load capacity for chipboard shelving. Fits box beams, provides support and increased load capacity for shelving. Cladding location bracket also shown. Protect the lower section of uprights against forktruck collision damage. 'U'-shaped or 'L' right-angle configuration. Provides pallet racking end protection. Available as a barrier rail (with support posts) to protect equipment / walkways. Displays caution and loading / safety information on racking usage, conforms with SEMA guidelines. 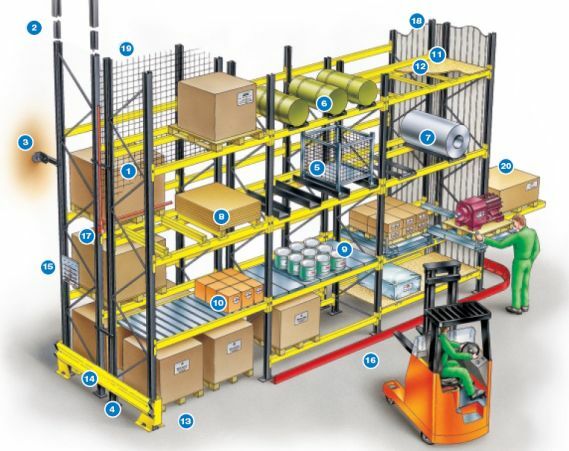 Provides safe and accurate guidance for narrow aisle forktrucks operating within racking. For fire protection within the pallet racking structure. Available to suit specific pallet frames / applications. Fitted for safety of personnel and security of palletised loads. Often fitted near walkways or working areas close to racking. Pick and Deposit (P&D) stations used at end of racks to assist load handling between fixed aisle and narrow aisle trucks. Finish: Link 51 Pallet racking components are phosphate pre-treated, then powder coated (some items wet painted) and stove enamelled to give a glossy, durable high-quality paint finish. 'House' colours and galvanised finish available on request. Material: Pallet racking components are made from high quality steel, every stage in the manufacturing process is subject to stringent quality procedures, developed through years of experience.